Vaduz and the Rhine Valley from above. One guidebook I read cautioned against visiting Liechtenstein for the “cocktail-party bragging rights.” But, so far as I can tell, there are only two reasons you visit the pint-sized principality, one condescending but honest (the novelty), the other more surreptitious (tax evasion). I’ve always been something of a geographical completist, one of those people who collects places, checks boxes, drives out of the way to get that last county in Maryland, visits Lansing just to have visited it. For that personality, the border crossing between Switzerland and Liechtenstein is entirely anticlimactic. Blink at the midpoint of the Rhine, not yet a major river, and you’ll miss the small white sign with the princely seal that unceremoniously marks your entry into the Alpine realm. You’d be forgiven, too, for missing the border crossing. Even the Swiss army has accidentally invaded on three occasions, ultimately nothing that couldn’t be solved with an apology and a case of white wine. Except for a too-perfect castle on a hill, the hamlet on the river’s right bank looks rather like the suburbs of the town on the left. But the latter sits in the world’s oldest democracy, while the former lies in the Holy Roman Empire’s last stand. That, and the passport stamp at the tourist office (price: three Swiss francs) makes it all worth it in the end. 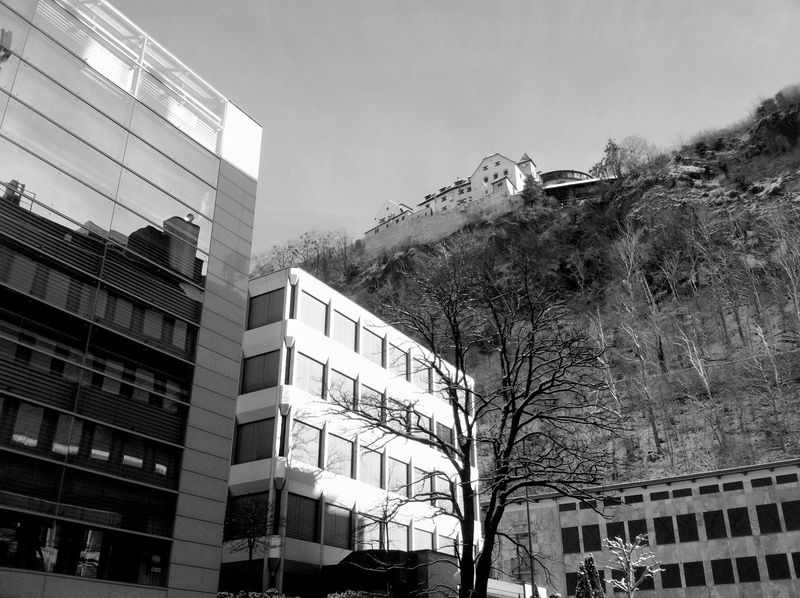 Vaduz Castle (Schloß Vaduz) above the city center. Vaduz is a member of an elite class of world capitals that lack any easy access. With no airport or train station, you can drive or, as we did, take the bus from neighboring towns in Switzerland or Austria. The bus ride from Sargans, on the Swiss side, lasts maybe half-an-hour and features a helpful television screen which recommends new music and movie releases. Marilyn Manson, for example. The ride takes you past a soccer field, a high school (imagine knowing everyone your own age in your country), and a McDonald’s (boasting a Grand Chicago Classic burger which in no way resembles any distinctly Chicago taste). More striking are the and rows upon rows upon rows of quiet, nondescript glass-box buildings, each with dozens of names of international corporations listed on signs out front. 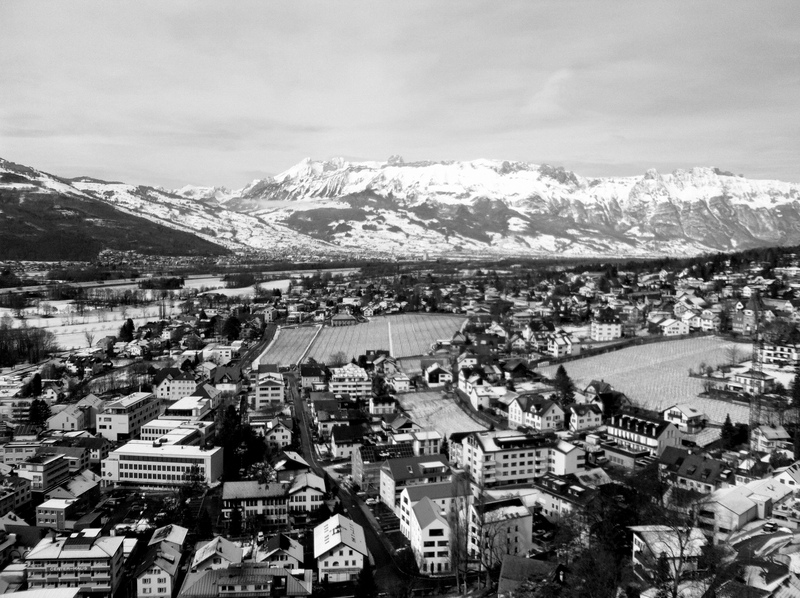 Low business tax rates, a tradition of bank secrecy, and lax corporate regulation have made made tiny Liechtenstein an economic powerhouse, home to far more registered corporations than people, the Delaware of Europe. By one estimate, the country has the second highest per capita GDP in the world, lagging only behind Qatar. But while Qatar has oil, Liechtenstein has only regulations, or rather the lack thereof. And dentures. Liechtenstein is, after all, the world’s biggest producer of artificial teeth. 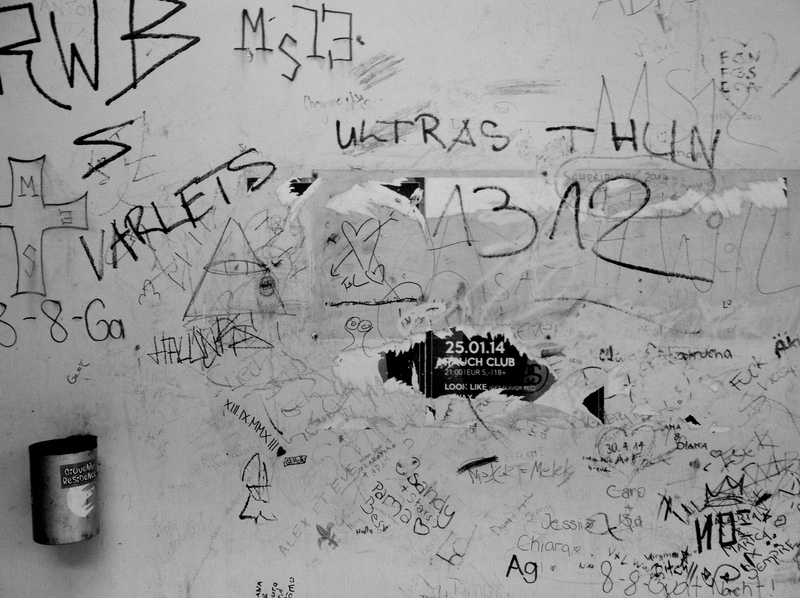 Even the wealthiest countries have graffiti. Of course, there are less licit funds here, too. 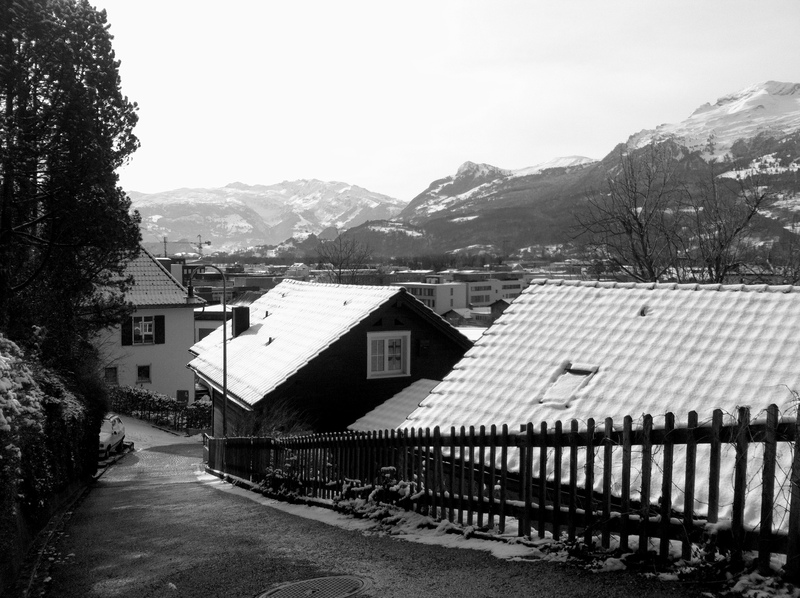 Even though, following a series of investigations in 2008 by the Germans and Americans, the country finally got rid of numbered bank accounts and bothered to implement some oversight of funds transfers from abroad, Liechtenstein is still one of the world’s foremost tax havens, though one official hastened to rebrand the country as a “safe haven” instead. 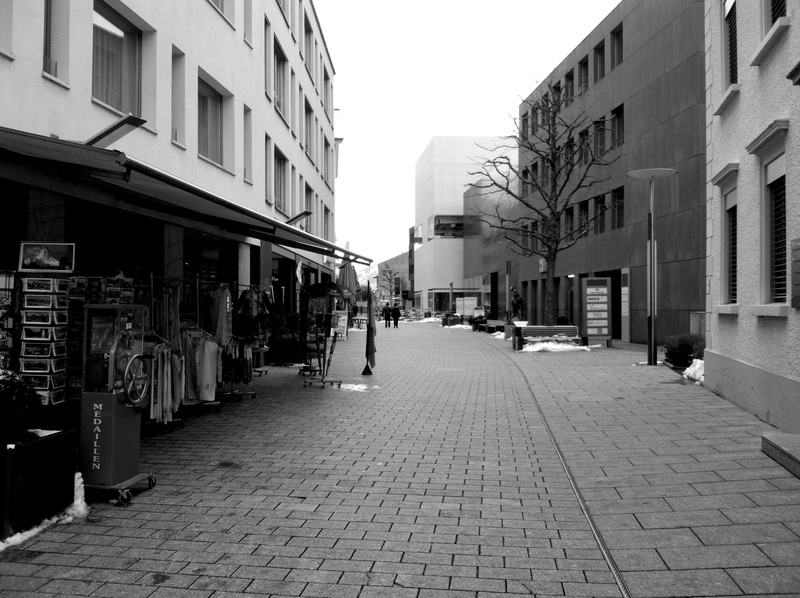 Still, despite the reforms, a walk along Vaduz’s main street, the pedestrianized Städtle, feels like a trip to one of the planet’s premier financial dry cleaners. Smartly dressed foreigners promenade up and down the main drag. Signs bear unexpected alphabets. Aristotle Onassis’s estate is quietly directed from an unassuming building at No. 27, and, somewhere nearby, another foundation manages IKEA’s intellectual property rights. Even family restaurants, like the banks, proudly accept all international currencies. Downtown Vaduz is a collection of bland, impersonal, late twentieth-century structures: a 1930s city hall, a few low-profile hotels, high-end shops purveying the Rolexes and Omegas ubiquitous in this part of the world, an art gallery, the Honorary Consulate of Mexico, a few small museums, several banks, the post office, the old and new parliament buildings, and the Cathedral of St. Florin (about as grand and historic as your local church). Städtle, the main street in Vaduz. The royal castle hangs perilously from a cliff over the capital like a stage set. It’s an easy hike up to the castle from the city center along a well-worn trail lined with placards describing, Burma-Shave-style, the country’s history and constitutional structure. An observation platform just below the castle offers a truly spectacular view across Vaduz and the Rhine Valley into the Alps of Eastern Switzerland. (From up here, especially in the snow, even the tepid concrete of the banks and corporate headquarters begin to look dreamy.) And, finally, there’s the Schloß Vaduz, which is basically an overgrown house masquerading as a medieval fortress. In a way, this is the Buckingham Palace of this part of the world, the seat of the last remaining monarchy in Central Europe. But, here, there are no grand gardens, no grand entryway, no colorfully-dressed imperial guard whose changing you line up to see. Every August 15, the national day, the entire population of the country is invited up to the castle for drinks in the garden. (The castle is too small to accommodate them.) On any other day, you might ring the doorbell if it weren’t for a chain slung low across the short driveway with a sign warning “Durchgang verboten / Entrée interdite / No entrance” in Gothic script. The castle from the road beside it. All this carefully disguises the fact that the castle is home to the family of the wealthiest monarch in Europe. Prince Hans-Adam II, the reigning monarch, claims a personal fortune of about $4.0 billion, and the family fortune is nearly double that. The princely family once made money off calculators, manufacturing the hand-cranked Curta calculator, which was widely considered the best portable calculator of the pre-electronic era. (If you care to see one, it’s on display at the country’s calculator and typewriter museum.) And the Prince still makes wines which you can purchase abundantly throughout town. 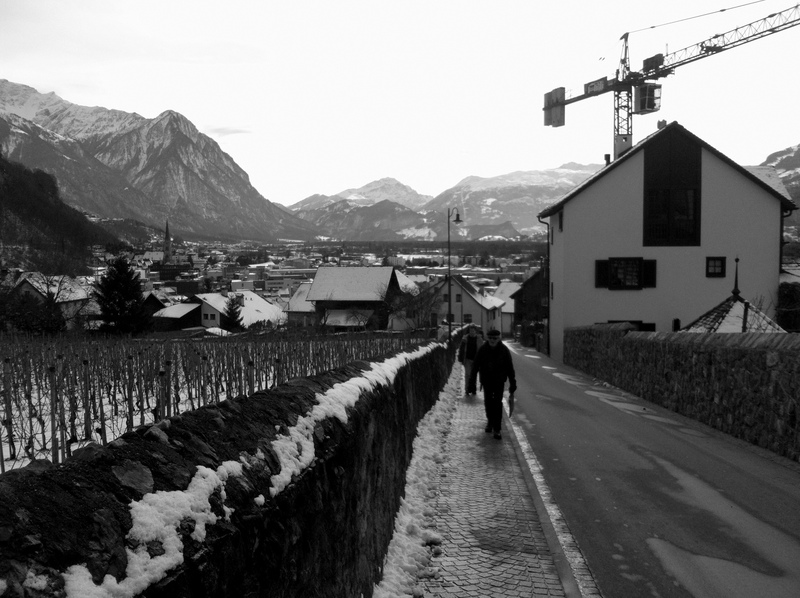 (Liechtenstein is apparently well-suited for viticulture, and the country of 37,000 claims over 100 vintners. Perhaps the loveliest thing about Vaduz today are the centuries-old, stone-walled vineyards still scattered among its blocks.) But the family’s wealth comes, naturally, from finance. The Prince’s family foundation owns the LGT Bank, the principal subject of the 2008 tax investigations. Their immense wealth aside, the royal family is adored by its subjects. Pictures of the Prince and his wife hang in shops and restaurants, and, the country’s red and blue flag, bearing the golden crown of their monarchy, flies throughout the capital and is emblazoned on every tchotchke in every souvenir shop in town. Vineyards and Alps near central Vaduz. But unlike the monarchies of most of the rest of Europe, this adoration is not merely symbolic. It is enshrined in the country’s constitution, which vests the Prince with greater power than just about any other monarch in the Western World: the Prince can veto any legislation passed by the country’s parliament. This power was bolstered by a 2003 referendum which passed after the Prince threatened to move to Austria if it were rejected. In 2011, a proposal to legalize abortion in the first twelve weeks of pregnancy was narrowly rejected after the Prince threatened to veto it. The following year, proponents managed to get a proposal on the ballot to strip the Prince of his veto power, but that referendum was ultimately rejected by 76% of voters. It’s hard to imagine the monarch of any other country threatening to move out of the country while still retaining the crown, but the House of Liechtenstein’s relationship with its country has always been strange. For one, the House isn’t native to Liechtenstein at all; it simply purchased the country in the late seventeenth and early eighteenth centuries to gain a seat in the Diet of the Holy Roman Empire. No member of the family visited the country until nearly a century later, and it took several more years for a sitting sovereign to make the trip. 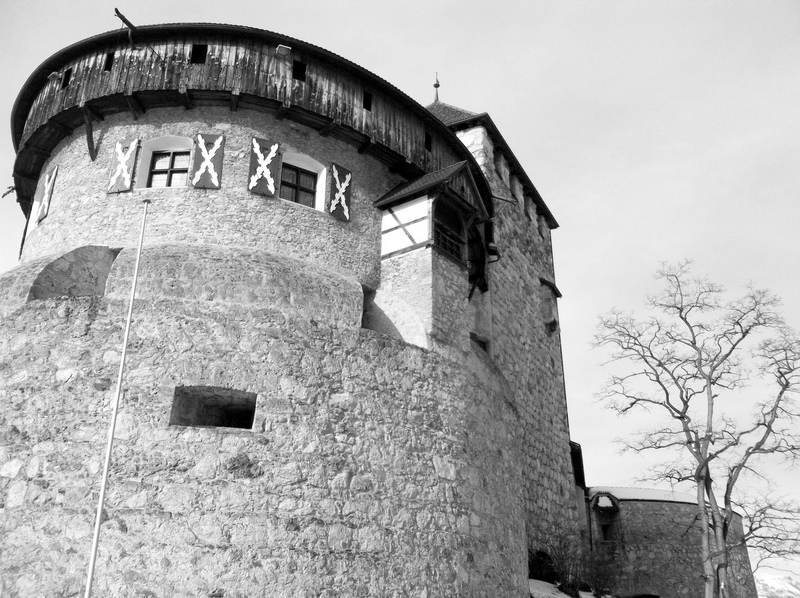 No monarch lived full-time in Liechtenstein until the father of the current prince moved to Vaduz in 1938, but the family still owns large estates around Vienna, 600 kilometers away, and once held vast holdings in Czechoslovakia which were eventually confiscated by that country’s Communist regime. (Liechtenstein refused to recognize or establish diplomatic relations with either Czechoslovakia or its successor states until 2009.) The family owns one of the world’s best private art collections which remains on display in Vienna, not Vaduz. Liechtenstein, the country, is left only with its Kunstmuseum, that has grown from a gift of ten paintings in 1967 to a six-roomed cube of black-tinted concrete and basalt that was once called one of the world’s ugliest buildings. (Really, it’s not all that bad. Just distinctive.) Across the street, there’s a one-room exhibit space, the Kunstraum Englanderbau, which, when we visited, featured a rather fitting art installation made up of redacted LGT Bank statements, a constant hint of the country’s primary occupation. Even stranger graffiti on the Städtle. Besides the two art museums, Liechtenstein, all 61 square miles of it, has everything you’d expect of a less miniature country: a national library, several institutions of higher education, two surviving castles and several ruins, vineyards, a ski resort, and even a Wild West-themed amusement park complete with a western town for rabbits. There’s a decent postal museum, a good reminder the world’s smallest countries appeal inordinately to philatelists, and a national museum housing a replica of the Princely Hat, the original of which went missing in the eighteenth century. But unlike most countries, you could have rented the entire country for $70,000 a night through Airbnb a few years ago. Snoop Dogg once tried to for a music video. He was rebuffed, but only because he hadn’t offered the country enough time to make suitable arrangements. 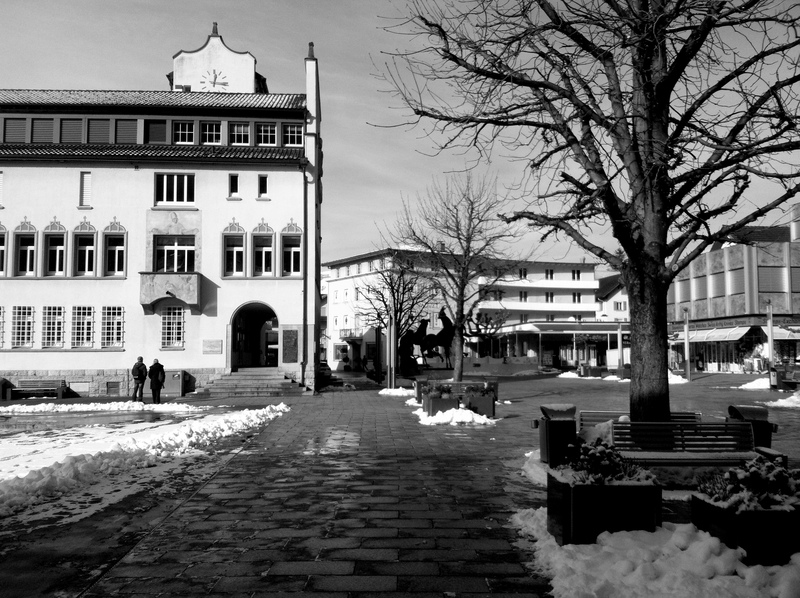 City hall and the main square, Vaduz. Otherwise, there isn’t much to Vaduz for the casual tourist. There’s the Red House, a landmark Vaduz is strangely proud of, which isn’t all that red (more orange), is closed to the public, and was once home to the country’s most famous creatives (who I bet you’ve never heard of). The Red House is in the old part of town, which doesn’t look all that old. The old town features one restaurant, the Schlössle Mahal, known for its Indian lunch buffet. The Schlössle Mahal is a good reminder that the town is, perhaps unsurprisingly, an international one. Vaduz attracts visitors from around the world — whether for the novelty, the scenery, or the financial services, one can only guess. The notes in the postal museum’s guestbook are in non-Latin scripts, the kebab stand down the street has signs in Russian and Chinese, and the information sign by the bus stop is written in major Western European but also East Asian languages. Restaurant Engel, across from the city hall, offers three menus, one Swiss/Austrian, one Chinese, and one Thai, prepared, respectively, by chefs from Portugal, China, and Thailand. The restaurant’s website defaults to English. Two men discussed business in non-native English beside a crowd of well-heeled Koreans who ate from the Chinese menu as I ate a surprisingly good green curry and drank an Austrian Traminer. The most fascinating thing about Liechtenstein was the quality of its Thai food. It’s too easy to picture Liechtenstein some fairytale kingdom at the roof of Europe. (Imagination is always getting in the way of real travel.) The Alpine scenery is beautiful, sometimes staggering, but in the foreground is a very imperfect tangle of finance, concrete buildings, and bizarre politics. I think the most surprising thing I discovered about Liechtenstein might be just how unsurprising it really was. I saw a country like any other, with real people who make their livings, govern themselves, and go about their lives as best they can. Sometimes those people just prefer palak paneer and Massaman curry to käsknöpfle and ribel. Vaduz as you might imagine it. Extraordinary article. Thanks for the interesting read!